Sometimes my interviews for my WIMR column are much longer than what I have room to print in the Advertiser, but sometimes they’re perfect length and substance. Such was my talk with writer Nora Okja Keller, author of “Comfort Woman” and “Fox Girl.” Her WIMR was published in January ’07. 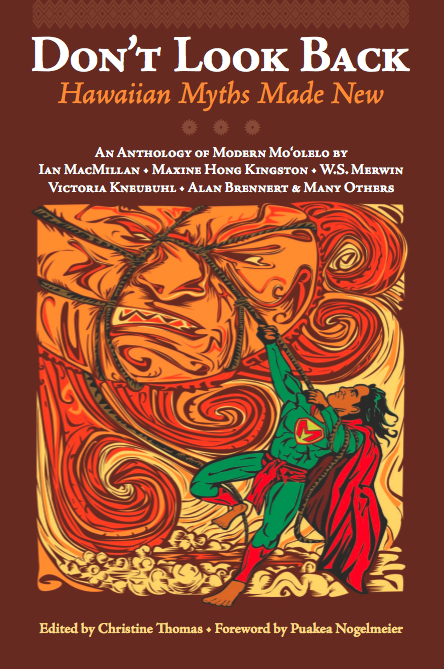 Our talk about folktales and myth was interesting, especially given my current project, an anthology of “new” Hawaiian myths by modern Hawai`i writers. I’m actually reading a couple of different books, because I have two daughters so I keep up with what’s at their age level. With my seven-year-old, I’m reading a collection of Mayan folktales by Rigoberta Menchu called “The Honey Jar.” She’s a Guatemalan activist. It’s interesting because there’s not a lot of Mayan folktales out there. I’m also reviewing a young adult novel called The Braid.” It’s a novel in prose poem by Helen Frost about two sisters separated in Scotland during the highland clearances in the 1800s. It’s geared toward middle school, which is my oldest daughter’s age. It’s so elegant and spare and the details are so touching. I’ve enjoyed reading it. I kind of keep in touch with what’s being published recently. I do some book reviewing for the DOE on an informal basis, so I see what’s coming out and do some reading. The ones that look appropriate or interesting I bring them home and share them with my kids. But for myself I’m reading Alice Hoffman’s “The Ice Queen: A Novel.” I think she’s wonderful the way she blends magic and realism. This one is based on the fairytale “The Snow Queen.” She uses it as inspiration and takes off from there. There’s some overlapping in all these. Alice Hoffman gets her inspiration from fairytales, which overlaps with the Mayan tales of creation. All three books are strongly women-centered, and all are about how do you maintain a connection, how do you try to overcome tragedy and continue to love and keep yourself open. -Are you drawn to these because your books do something strikingly similar–delve into our past tragedies and how to find the beauty in life despite those? Definitely. That’s exactly it. How do we move forward, how do we continue to love and heal, both as individuals and as a family. What are the things we choose to carry into the future, what from the past has meaning that we want to take with us. … I wouldn’t just say this is similar to what I do. And I picked all of these with different intentions in mind, but it is funny when I look and think, both of my books have the inspiration of a folktale and then see how they build on that too. So definitely as I’m reading I see similarities and common themes. But it’s also just the pleasure of reading the language. Photo linked to the Honolulu Advertiser, Mahalo!